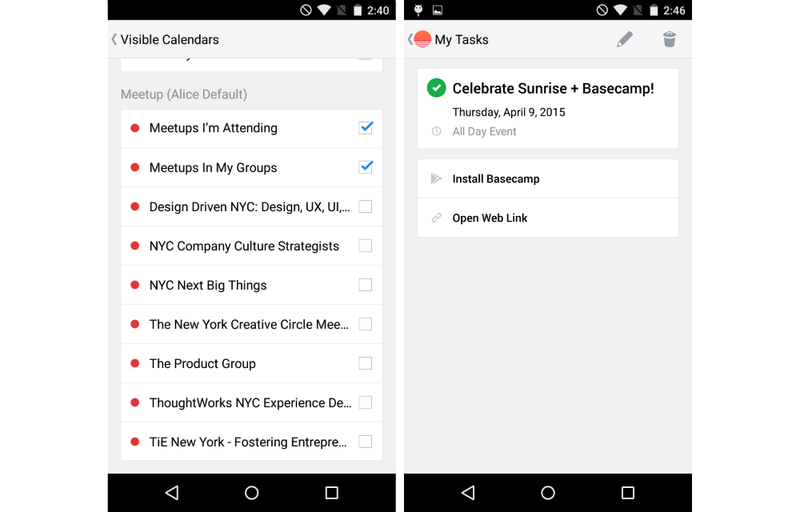 To help users manage their days better, Sunrise Calendar has introduced two new service tie-ins, those being Basecamp and Meetup. For all of you that are unfamiliar with these services, Basecamp is a project management application, used by companies all across the country. If you are on a team that uses Basecamp, this addition will be most beneficial for you, as tasks can be viewed straight from within Sunrise. Meetup is a social network of sorts, where members can join groups, then organize meet ups. For example, boxer owners can join their town’s respective boxer group, then attend boxer meet ups for all of the pups to run around together. With Meetup service tied into Sunrise, now you will never miss another meet up of your group. To take advantage of these new additions, grab the update from Google Play.